Put the fresh spinach with the rinse water still clinging to it in a large Dutch oven with a lid. Place over medium heat, cover, and steam for a few minutes until it reduces in volume. Uncover and, stirring occasionally, cook for 1 to 2 minutes longer. Drain, cool, and chop the spinach. Put the oil and scallions in a large saucepan over medium heat. Once the scallions start to sizzle, lower the heat and cook slowly, stirring often, until tender, about 5 minutes. Stir in the garlic and cook for a few seconds. Stir in the chopped spinach and anchovies; cook for a minute or two. If using frozen spinach, cook a couple of minutes longer at this point. Taste the spinach and season it with salt and pepper. Stir in the parsley and paprika. Cool the filling. While the filling is cooling, divide the dough into 80-gram pieces and shape each into a flat disk. Roll each piece of dough into an 8-inch disk and chill if you’re not going to assemble the empanadas immediately. Arrange the disks of dough on the work surface and brush the edges with water. Divide the filling equally among the dough rounds, mounding it in the center of each one. Fold the dough over to make fat half-moon-shaped pastries. Press the edges of the pastry together with a fingertip, then fold and overlap the edge of the dough to seal the empanadas. 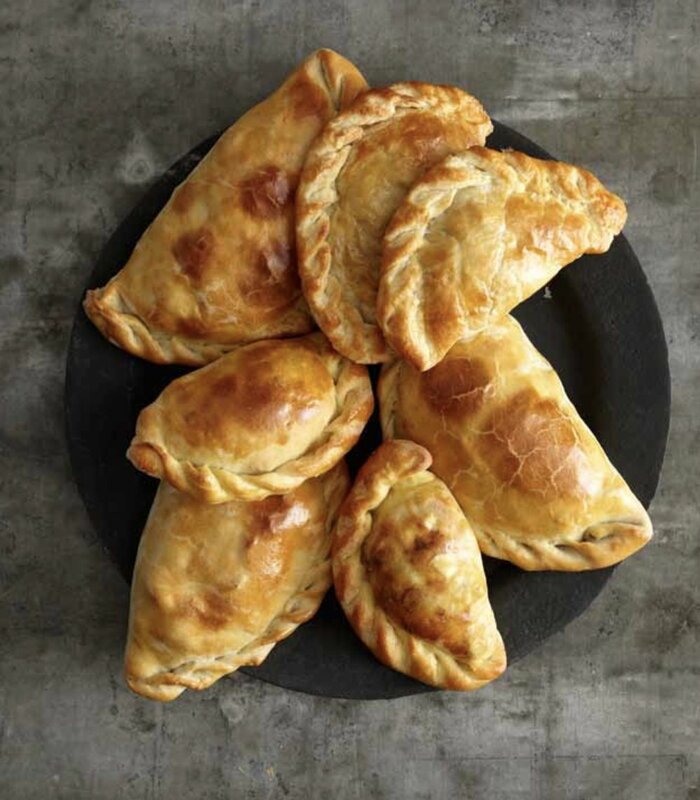 Chill the empanadas, loosely covered with plastic wrap, until you’re ready to bake them, up to 24 hours. When you’re ready to bake, set a rack in the lower third of the oven and preheat to 400°F. Arrange the empanadas on a cookie sheet lined with parchment and brush them with the egg wash, making sure not to let puddles accumulate on or under the empanadas. Place the pan in the oven, lower the temperature to 375°F, and bake until deep golden, 20 to 25 minutes. Cool the empanadas briefly on the pan on a rack and serve warm. Combine the flour and salt in the bowl of a food processor and pulse several times at 1-second intervals to mix. Add the butter and pulse repeatedly until it’s finely mixed into the flour and no visible pieces remain. Spread the sour cream all over on the top of the flour and butter mixture (rather than adding it all in one spot). Pulse 3 or 4 times; if the dough is already starting to form a ball, stop pulsing; if not, pulse a few more times but don’t overmix or the flaky quality of the dough will be lost. Invert the dough onto a lightly floured work surface. Shape it into a disk and wrap in plastic. Chill the dough for 2 to 3 hours or overnight before using it.